Note to everyone: don’t diss Julia Roberts’s manicure. ET reports, one person learned this lesson the hard way. 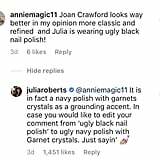 Fans in the comments section are loving her response, saying, “yas Queen you tell em’—” and “Julia Roberts is an icon who needs no comparison to anybody!” While trolling on Instagram is never appreciated, let this serve as a nice reminder to at least learn the correct nail polish shades before hating on someone’s manicure.